Tendo City, Yamagata is a one-hour flight north from Tokyo’s Haneda Airport. The mountainous area seems like Stowe, Vermont—with the added attractions of hot springs, restaurants proclaiming the area to be the leader in Japan for ramen and soba noodles, and factories that make most of Japan’s Shogi (chess) sets. 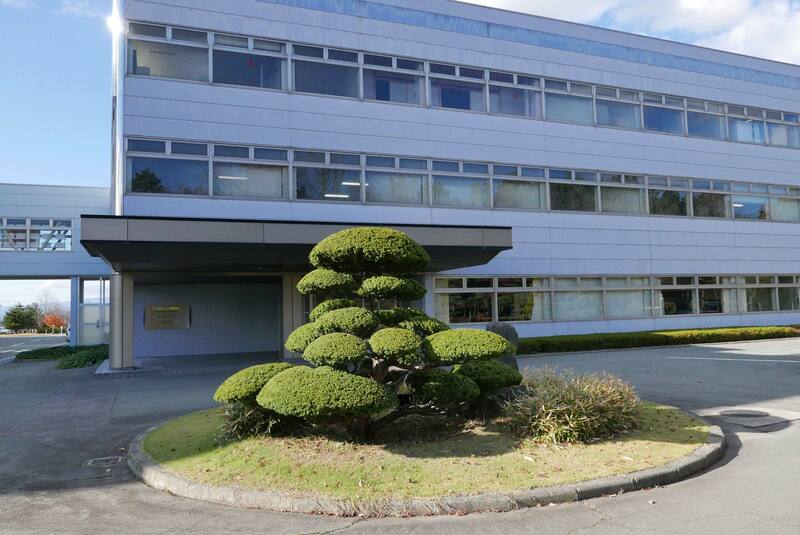 We are here to visit a different kind of factory: Panasonic’s Yamagata Lens Factory. So here I was, a year later, in the North of Japan, not far from the lens factories of other famous manufacturers. A highly skilled workforce and pristine supplies of clear water contribute to the choice of location. Panasonic’s Yamagata Plant was established in 1982. It is 13,600 square meters (146,389 sq ft). 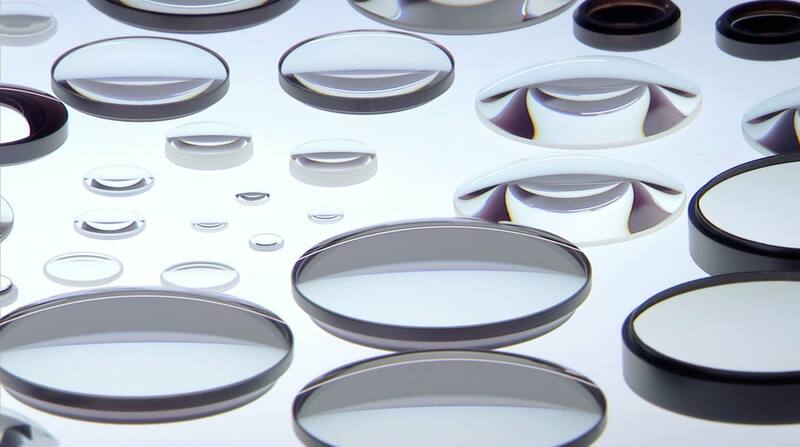 Spherical lens manufacturing started in 1987, followed by aspheric optical element production in 1989. Today, there are 484 employees. Our hosts were Mr. Yoshiyuki Suzuki, Manager of the Optical Business Planning Team; Kiyokazu Ishiyama, Manager of the Engineering Team; Masayuki Itagaki, Manager of the Lens Engineering Section; Kyoichi Miyazaki, Chief Engineer and Lens Designer in Kadoma City, Osaka; Noriaki Wada, Merchandising Group Chief; Kunihiko Miyagi, Professional Video Business Unit Director; and Ms. Megumi Sato. The Yamagata factory manufactures glass aspherical elements from 1 to 75 mm diameter, and plastic aspherical elements from 2 to 38 mm diameter. Of course, some cine lens elements can be larger than 75 mm diameter. 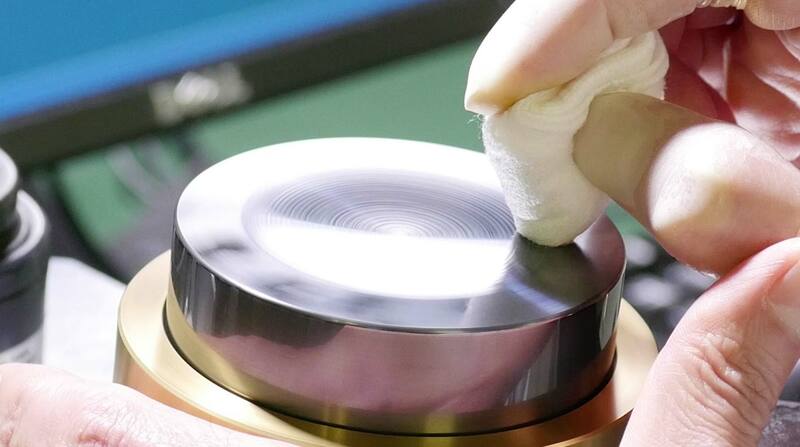 But, unlike the labor-intensive grinding and polishing we’ve seen before at cine lens optical factories, most of the work here is automated by machines. Instead of using abrasives and slurries, the work here is done by precision glass molding. It works like this. A mold is machined from a very hard, heat-resistant material. I believe it’s ceramic. The mold is the reverse shape of the optical element to be formed. 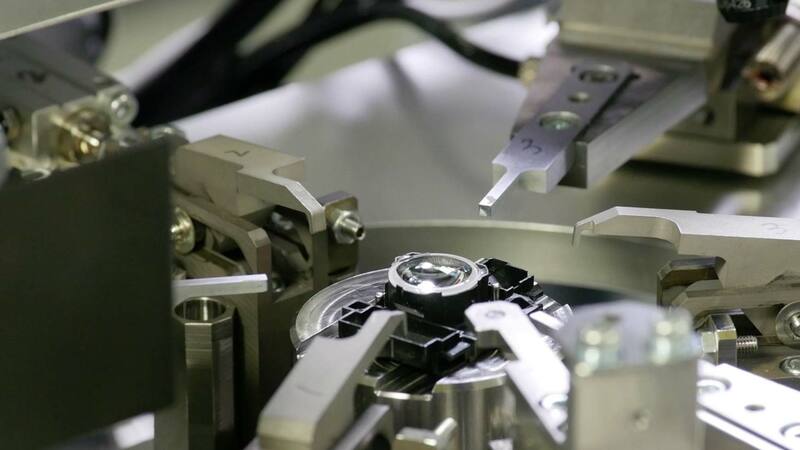 It is finished by hand by highly skilled technicians to tolerances better than 1 micron. This eliminates any ridges or textures that might contribute to the dreaded “onion ring” bokeh effect which appears as concentric circles. Once the mold is ready, blanks of glass, ground roughly to the size and shape required, are heated until they soften and become malleable (around 700 – 1,000 °C). 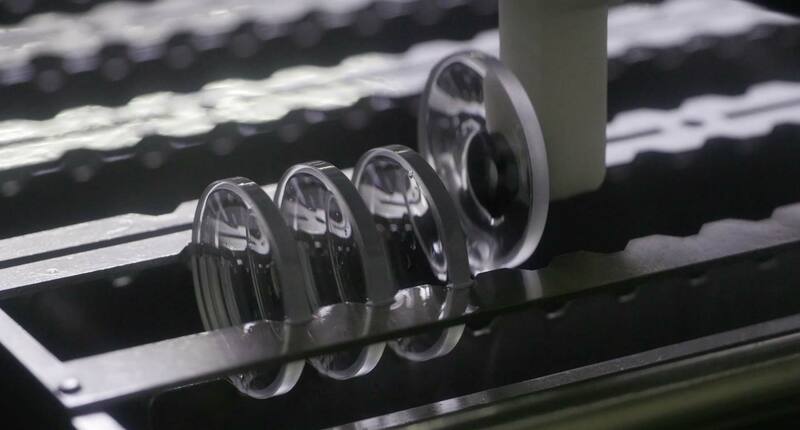 The mold squeezes together under high pressure, forming the finished lens element to a tolerance of less than 2 microns. All this is done in a matter of seconds. Traditional polishing can take hours. Automation yields aspheric elements up to 75 mm diameter. 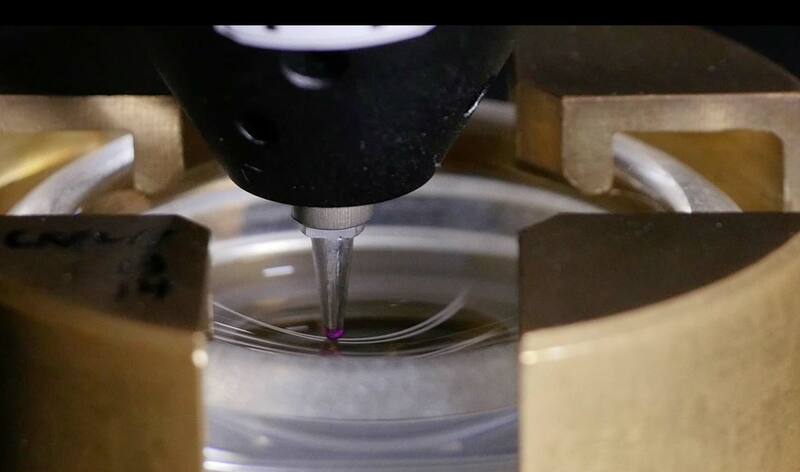 Centering to within 2 micron tolerance. 3D Profilometer developed by Panasonic measures to .1 micron (1/10,000 mm). Each lens is cleaned and hand inspected. 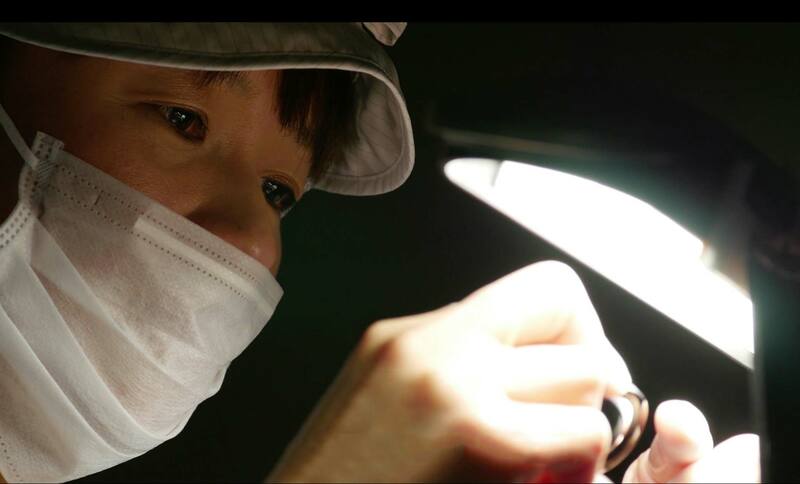 Advanced lenses are manually finished by skilled craftsmen and women. Quality assurance is certified by Leica. 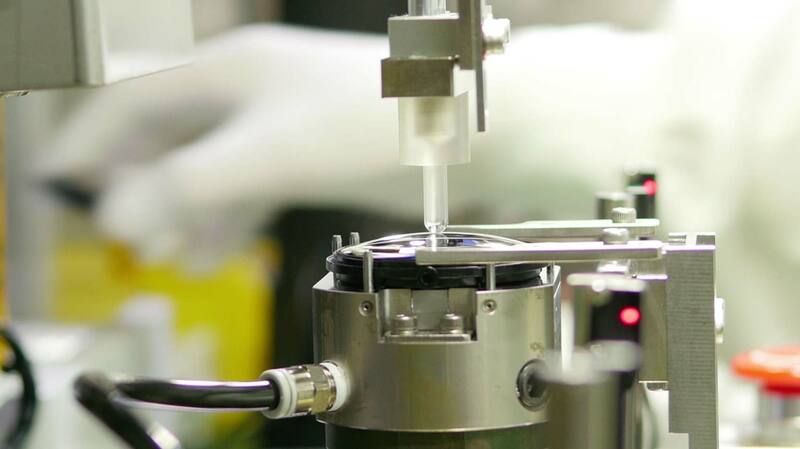 Automated lens assembly. Photos courtesy of Panasonic. 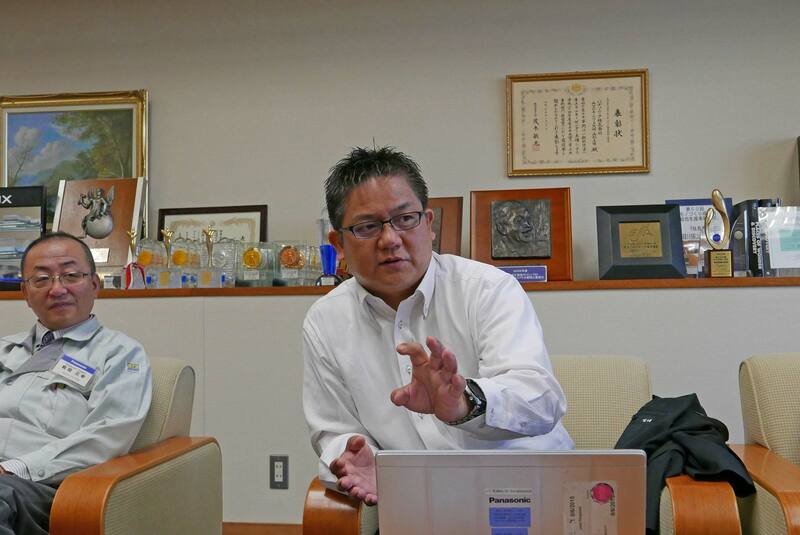 Mr. Kyoichi Miyazaki is Chief Engineer and Lens Designer at Panasonic’s headquarters. He works on developing optical systems for digital still cameras, camcorders and other optical devices, reporting to Panasonic AVC Networks VP Mr. Takuya Sugita. 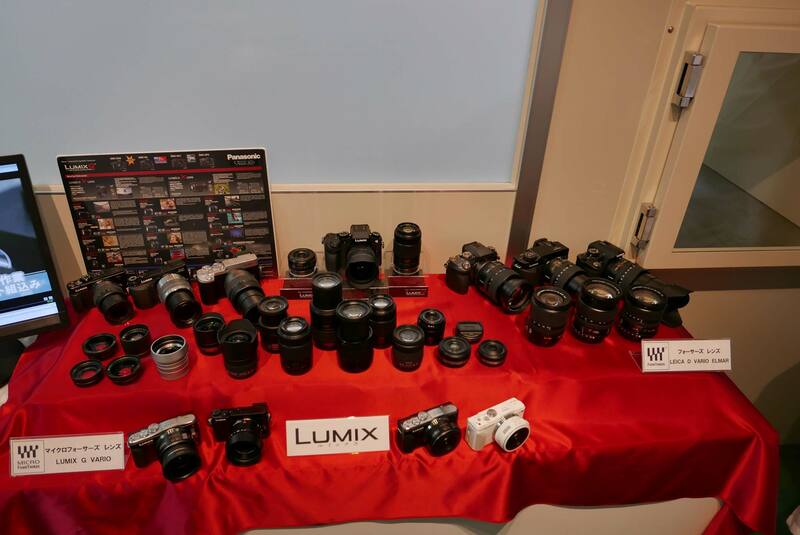 Panasonic has a large portfolio of still photography lenses for their compact cameras and LUMIX Micro Four Thirds mirrorless cameras. (MFT has an imaging area of 17.3 mm × 13.0 mm (21.6 mm diagonal). 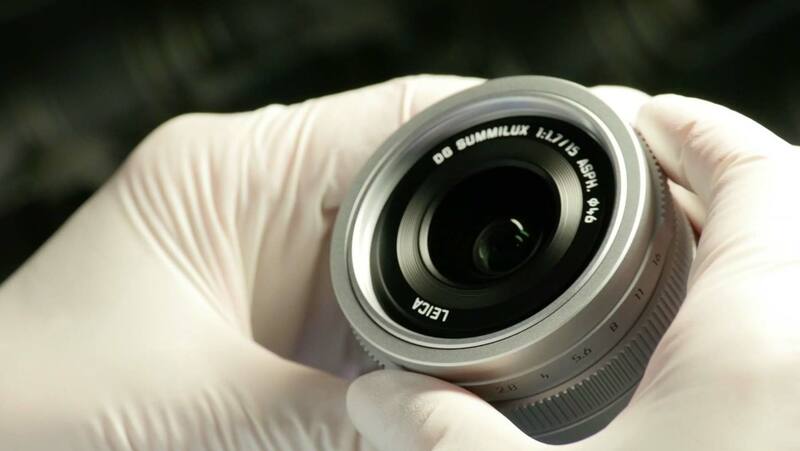 The MFT interchangeable Leica DG Lenses include the impressive NOCTICRON 42.5 mm / f1.2 ASPH, SUMMILUX 15 mm f1.4, 25 mm f1.4, and MACRO-ELMARIT 45 mm f2.8 O.I.S. The Leica DG NOCTICRON has 14 optical elements in 11 groups, including 2 aspherical elements, internal focus, silent operation, and Optical Image Stabilization. LUMIX G X Lenses consist of: X Vario 12-35 mm f2.8 OIS, X Vario 14-42 mm f3.5-5.6 Power Zoom with OIS, X Vario 35-100 f2.8 OIS, and X Vario 45-175 f/4-5.6 Power Zoom with O.I.S. LUMIX G lenses include 10 primes and 13 G Vario zooms, covering from an 8 mm Fisheye to 300 mm on a zoom. Mr. Miyazaki said that Panasonic’s Yamagata plant is the only one that can now mold large aspherical lenses up to 75 mm diameter. They are molded, not polished, with an accuracy under 1 micron. Smaller molded glass elements (up to around 10 mm diameter) can be molded to an accuracy under .1 micron. 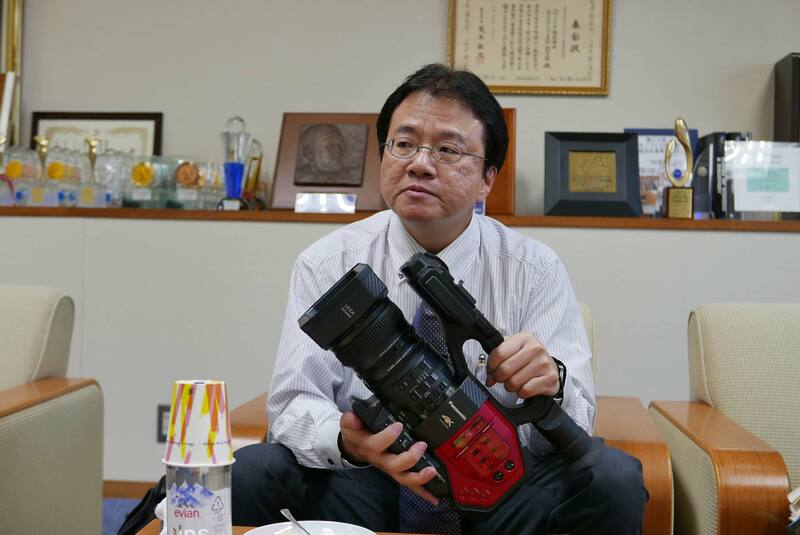 Mr. Miyazaki talked about camcorder lenses. “With camcorder lenses, especially on 4K cameras, it is especially important to minimize shaking. That emphasizes the need for good Optical Image Stabilization. “We also want to minimize focal length changes (breathing) when focusing. Focus must remain consistent when zooming, and it’s important that the motors are silent. When designing for still photography, we don’t have to be so concerned about this. But for video, and especially 4K video, these are critical. “Digital Still Camera interchangeable lenses must reach the camera’s resolution of at least 23 million pixels. Even though 4K is around 8 million pixels, the lens still should still have a resolution as high as the still camera lenses. I asked whether Panasonic was building interchangeable lenses for the professional cinema market. Mr. Miyazaki said, “Not yet.” But I don’t think that means they couldn’t or wouldn’t. Kunihiko Miyagi is Director of Panasonic’s Professional Video Business Unit. He announced Panasonic’s AG-DVX200 camcorder at NAB 2015 and launched it in September at IBC. The DVX200 is a 4K handheld camcorder with a single Four Thirds (MFT: Micro Four Thirds) sensor and attached Leica 12.8-167 mm (13:1) f2.8-4.5 zoom lens with 5-axis stabilization. It’s documentary camera sized, and weighs about 6 lb. The camera records 4K MP4 or MOV to internal SD cards: 4K at 24 fps, UHD 4K to 60 fps, and HD (AVCHD) to 120 fps. US list price is $4699 and a quick online search shows a $4195 street price. Mr. Miyagi explained the camera. “We created the VariCam 35 as a production camera. There are several reasons for this camera—the AG-DVX200. It is more affordable. We can reach a wider audience. “Our code name for the DVX200 was VariCam Mini. We decided not to use that for the actual product name. It doesn’t even have the VariCam name on it. We save that for the top of the line models. This is for more affordable and independent markets, documentaries, reality, corporate, event, second-unit and broadcast. “The other reason for the DVX200 was that we had created another camera that really defined an era in the earlier days of DV. This camera continues that legacy. It is like the successor. We think the DVX100 is more the inspiration for this successor camera than the VariCam 35. “The DVX200 is our 4K entry model. Almost every other manufacturer has 4K cameras with interchangeable lenses. This one is fixed. It has the most zoom range. We were able to create it because we have the technology to build its special lens. Using the strength in our lens manufacturing and especially aspherical technology, we were able to make a large ratio zoom lens in a very compact size. It has good design, autofocus and OIS. Lots of orders are coming in so it’s keeping our factories busy. “As you can expect, there will be something new—for your NAB issue. It seems like every year we are coming out with a new camera, and that is our commitment to the production market. We are continuing to invest in the technology to develop the sensors, signal processors and the lenses, not only for next year, but for years to come. As you can expect, the investment is very high, especially for the optical division. “The S35 format has good points (VariCam 35). The good thing about the Four Thirds lens format is that it is compact and affordable, and still has shallow depth of field. It could be mainstream for this format. The Four Thirds and Micro Four Thirds (MFT) Systems have a single image sensor measuring 17.3 x 13 mm (diagonal of 21.63 mm), which is half the diagonal length (44 mm) of the Full Frame format 36 mm x 24 mm. “The 4/3 flange depth is 38.67 mm. MFT flange focal depth is 19.25 mm. The image sensor size is the same for both. “The DVX200 achieves a 13:1 zoom ratio in a lens that’s only about 7” long, and weighs under 2 pounds. Remember, a 7.5:1 zoom ratio cinema lens like the Fujinon 24-180 is over twice as long (16” ) and ten times as heavy (the lens itself weighs 19.6 lb).